Desert Harvesters working the hammermill. 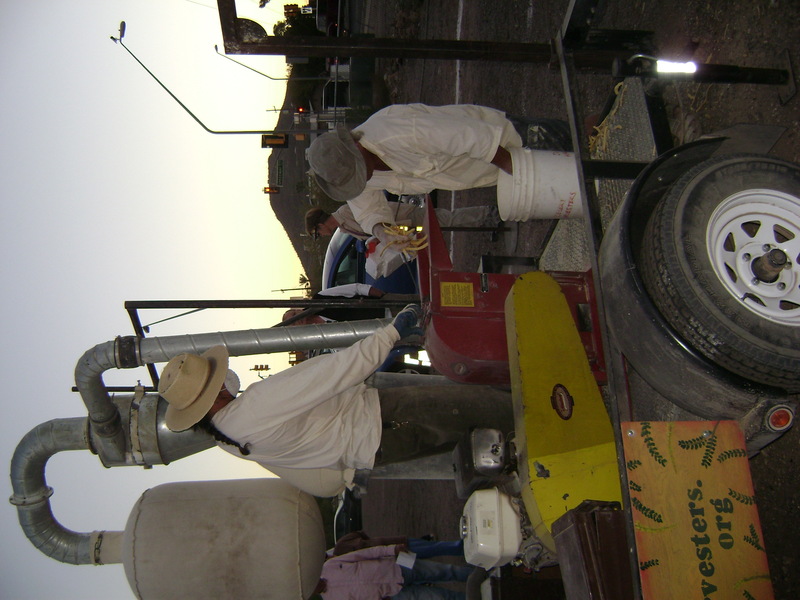 If you’ve been gathering mesquite pods, now is the time to schedule a visit to one of Desert Harvesters’ milling sessions if you live in Tucson or the surrounding valleys. The charges are reasonable and the savings in time and energy over doing it yourself are substantial. You’ll end up with lovely fine flour ready for all your best recipes. Nov. 5 – Tucson Audubon Center, Thornydale and Hardy, 9 a.m.
Nov. 20 – Dunbar-Spring neighborhood, 8 a.m.-2 p.m., bake sale also. Before taking my pods to be ground, I always spread them out on a piece of hardward cloth on my back brick patio and pick them over, discarding any dark spots. Then I hose them off and let them dry. Mesquite pods pick up moisture, even from the atmosphere and get gummy, so do your washing several days in advance to allow them to get really dry. Then I put them in a pristinely clean five-gallon paint bucket with a lid. The mill operators will return the bucket to you with the pods magically transformed to fine meal. Once you get home with your beautiful mesquite meal, you’ll be anxious to use it in something delicious. Try adding just a quarter cup to any of your favorite baked goods. Or if you want some ideas and more precise direction, pick up a copy of my new cookbook Cooking the Wild Southwest, Delicious Recipes for Desert Plants. There you will find recipes for Mesquite Carrot Dinner Rolls, Mesquite Banana Cake, Mesquite Ginger Cookies, Holiday Bars and many more. 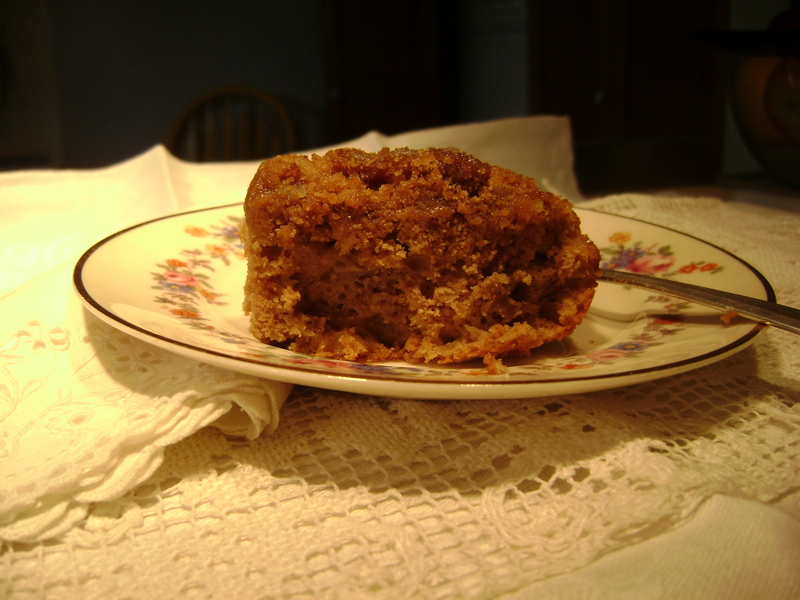 The picture below is of one of my favorites, Mesquite Apple Coffecake. Good for a brunch or a get together with girlfriends over coffee or a bookclub meeting.